The renovation is really coming along at the house. We got a WHOLE lot completed last week, and are already flying into this new week. Our electrical was completed a couple days ago (happy dance!) and it is such a luxury to have outlets when we need them (instead of getting an extension cord for an outlet on the other side of the room). And we have light switches in normal locations! It feels so amazing. Our insulation is also completed! We used spray foam insulation for the two bedrooms with vaulted ceilings. The other spaces we used a spray-in cellulose insulation. 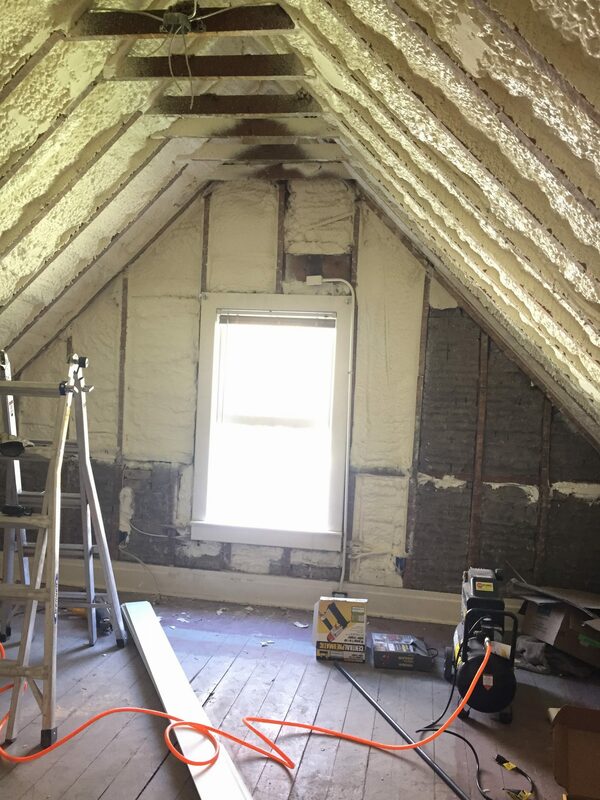 The spray foam was our most expensive option, but it really was our only option to get the R-value we needed in those attic rafters that were only a few inches deep. It feels so nice to know that our heating bills will no longer cost $330 a MONTH during the winter! 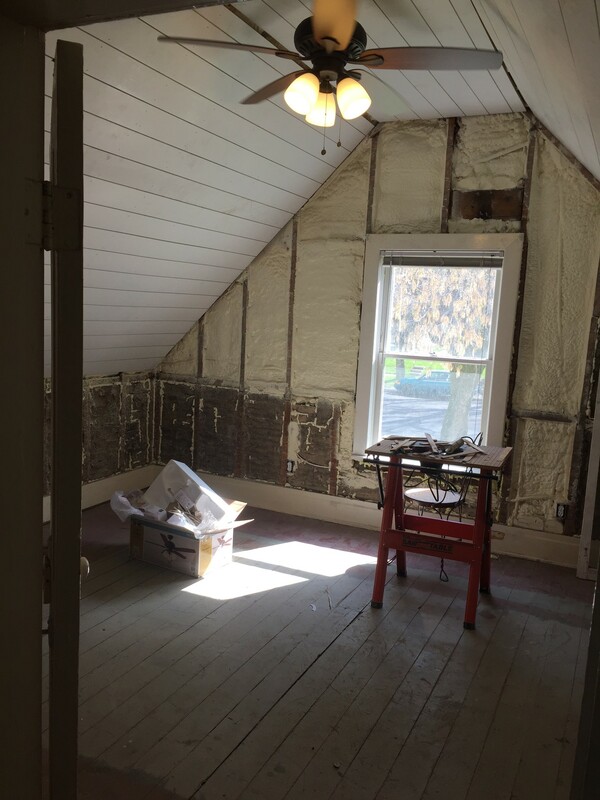 As you can see from the pictures, we decided to shiplap the ceilings in the two attic bedrooms. We still need to add trim to fix those weird gaps – that was not a measuring error on our part. There literally was not a single level surface in that bedroom. I suppose that is what happens to a house that was built before all of the fancy gadgets, and has had 100 years to settle. Lets just say that there are a LOT of shims that when into that ceiling. We used “real” shiplap for this project. I am so glad we did! 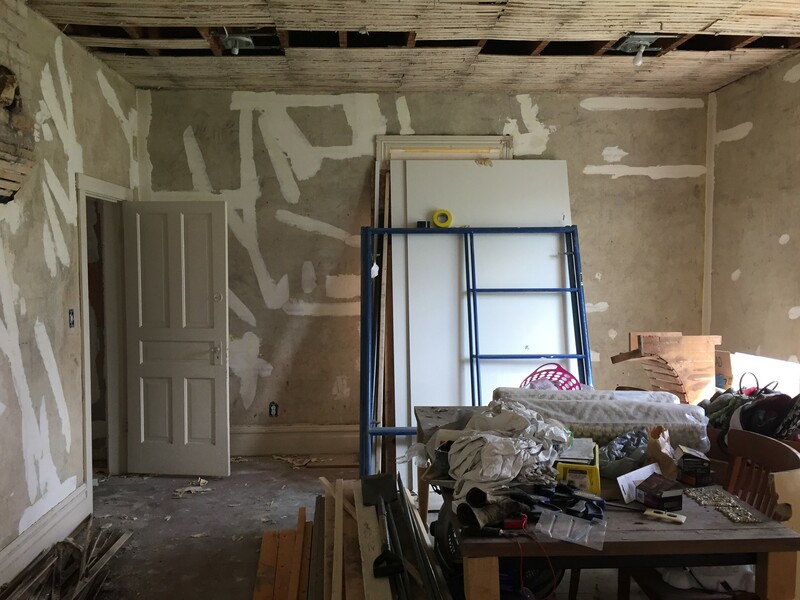 The cost was substantially higher than buying plywood and stripping it down for the “faux shiplap”, but we wanted something substantial as our only wall between our girl’s bedroom and the insulation. This topic calls for a post on it’s own, so stay tuned for that. Yesterday we had a mud and tape guy come and start patching the cracks in our walls, and he will skim coat our walls and make them perfectly smooth again. We originally planned to do this ourselves, but we have seen many DIY wall texture jobs, so we decided this one was best left to the pros. Also, it wasn’t as expensive as we thought it would be AND the mud and tape guy can be done in a week. It would have taken us a month (or more). 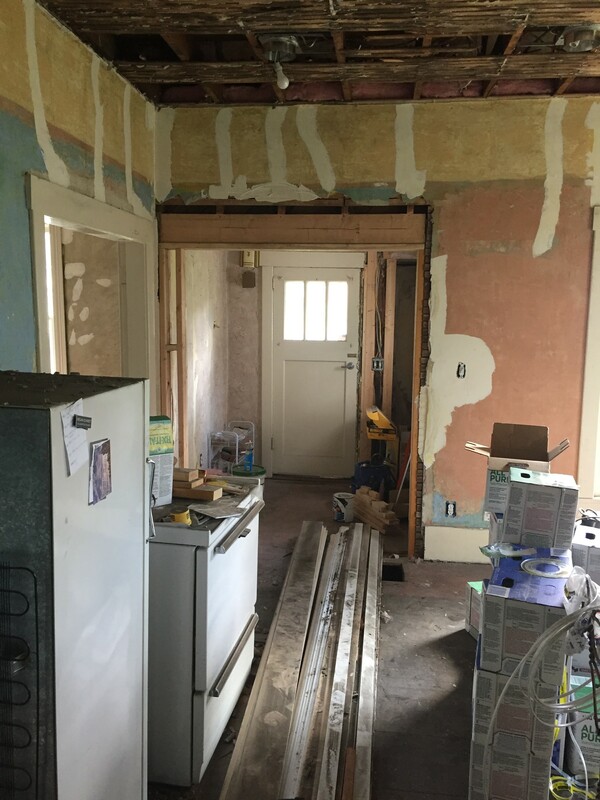 We also got the wallpaper removed in our little “butlers pantry” and I cannot wait to see this space come together. I have a feeling it will be one of my favorite spots in the house. So, what is next? Painting, kitchen cabinetry, and flooring of course! 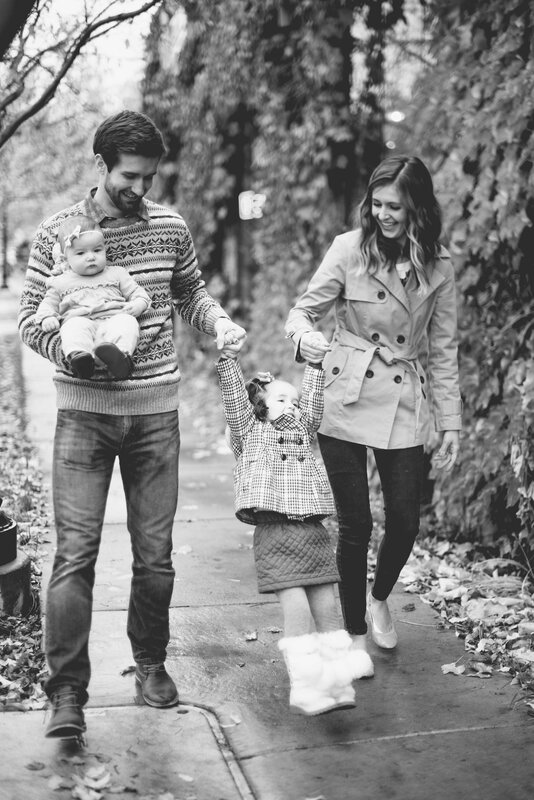 Seriously, we are on the home stretch here! As soon as the walls are done I plan on painting my brains out (I borrowed a paint sprayer from my uncle that I hope will make the job much quicker) and the Mr. will be completing the lower cabinets in the kitchen. After the painting is done we will install the floors. We are getting SO. CLOSE. I am 90% sure that our wall paint color will be Sherwin Williams Alabaster (a white). I love the creamy-ness of this color, it adds the prefect touch of warmth without making the room seem yellow. The trim will be a basic white, and I am still undecided on the exact white color I will paint the upstairs floors. Probably basic white as well. 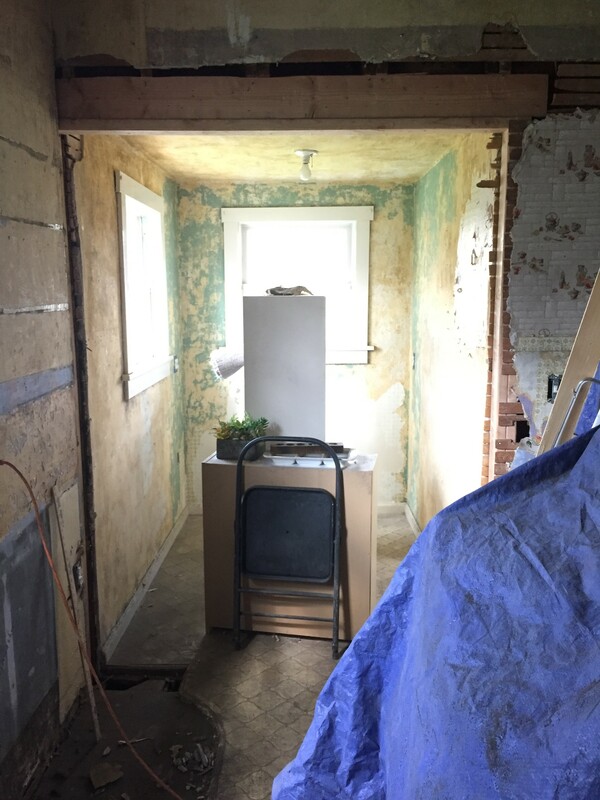 I hope you are enjoying following along with this crazy renovation. We are getting super excited now that we can see the light at the end of the tunnel!